Step right back, ladies and gentlemen, into the nineteenth century. Turn the oversize pages of Shumway’s Illustrated Garden Guide slowly or you may miss the rattlesnakes you want to add to your 2012 garden. This is the company’s 142nd year of seed selling. 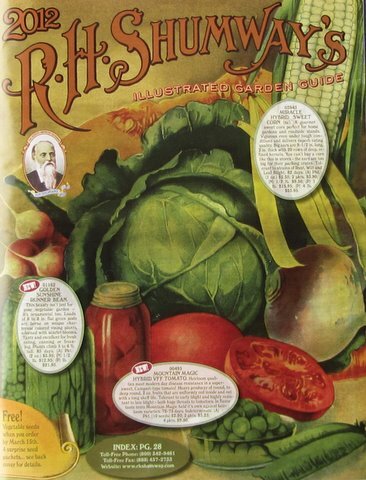 Unlike most seed catalogs, Shumway’s is illustrated with line drawings in the style of a hundred years ago. Sixteen of the catalog’s 64 pages are in color, but the rest are in stunning black and white. 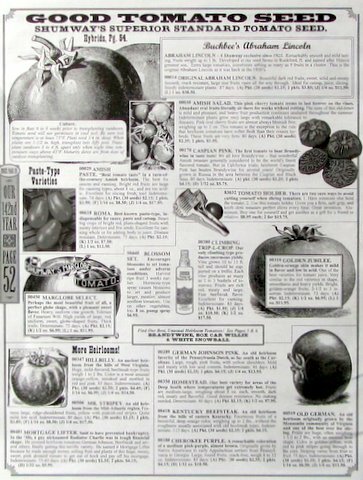 Most of the color pages offer flowers and herbs, and all of the black-and-white pages offer fruits and vegetables. If your dad—like mine—spoke of planting by the moon, don’t miss the great offer on the 2012 paperback edition of Moon Sign Book, “a popular astrological guide since … 1905 … complete tables and instructions on planting and harvesting … accurate and reliable.” It’s the same moon, I suppose, but it now has some human footprints. If you order the moon book, why not add the Tomato Holder? I love the description: “There are two sure ways to avoid cutting yourself when slicing tomatoes. 1. Have someone else hold the tomato. 2. Use this tomato holder. Gives you a firm, safe grip, and knife slots measure perfect slices every time. Great invention! Aluminum.” If you tend to amputate fingers while slicing tomatoes, hey, cut your losses and order a Tomato Holder. The corn pages contain varieties I’ve seen in no other catalog—Bonus Hybrid ‘Baby Corn’ that produces those miniature ears you find in salads and exotic foods and Goliath Silo or Ensilage Seed Corn, which grows to 15 feet and yields up to 50 tons per acre. Your cows will be delighted if you cut, chop, and ferment it in your silo for their winter feedings. And for violence-prone gardeners who are sick and tired of burrowing mammals, there’s the four-pack Revenge Rodent Smoke Bomb to toss into those burrows … “safe [for the quarterback, not the receiver] and easy-to-use … absolutely guaranteed.” Many years ago I tossed something like that into a groundhog burrow under one of the huge tulip poplars at the edge of our woods. Apparently there was an interception because the next morning I found the bomb about three feet outside the burrow entrance. Groundhog 1, Bob 0. I haven’t ordered from Shumway’s recently, but I’m going to order a moon book, maybe some rutabaga seeds (I seldom see them on seed racks locally), and maybe a rattlesnake or two. The reptiles, of course, would be Georgia Rattlesnake Watermelon and Rattlesnake Climbing Bean. Second, thought, our little plots on our hillside don’t have room for such wide-ranging veggie critters. Prices are reasonable: Celebrity Hybrid (30 seeds), $2.75; Juliet Hybrid, not available; Better Boy Hybrid (30), $2.45; Brandywine Pink (30), $2.10; postage/handling, $6.00 on orders up to $30. To take a look at Shumway’s catalog, CLICK HERE. Unfortunately, veggie illustrations online are mostly color photographs, which makes the Internet edition colorless, as far as I’m concerned. If you want to see the “real” Shumway’s catalog, go online and order a print copy. Anne posted a Comment after my last catalog review posting: “My favorite home garden seed catalog is Pinetree Garden Seeds. They sell nearly everything you might want to try, the quantities are small and prices are very reasonable. So instead of agonizing over which variety to get, I can go ahead and get several kinds, often for less than a dollar a packet and just enough seeds for a season or two.” To take a look at Pinetree Garden Seeds online, CHECK HERE. Kent recommended Meyer Seed Co. of Baltimore: “You can find Meyer Seed on the web and order a catalog. They carry most of the varieties recommended by the University of Maryland. Their prices are pretty good compared to a lot of the mail order companies.” To check out Meyer Seed Co., CLICK HERE. Notes: (1) You can order a print catalog through most of the catalog websites. (2) Mention of specific products, brands, or companies is not intended as an endorsement by the University of Maryland. (3) I do not receive consideration of any kind for mentioning products, brands, or companies in my postings. The seed catalogs I review are those from sellers from which I have previously bought seeds. I was referred to you by our Garden Club. Do you carry fruit trees? We are part of the University of Maryland Extension and provide gardening and pest management information to Maryland residents. We do not offer plants for sale. You can ask your local garden center if they carry fruit trees. There are also sources online, such as Edible Landscaping or Stark Bro’s.